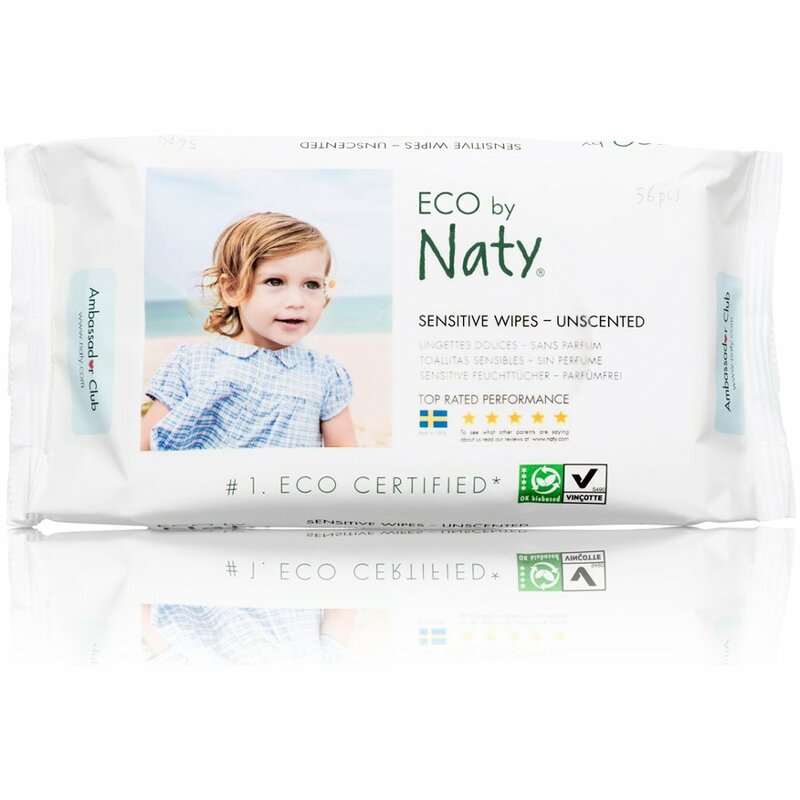 Unscented baby wipes for made especially for babies' sensitive skin from Eco by Naty. The biodegradable wipes are chlorine and perfume free, so completely safe for your baby, made from 100% beech wood tree pulp from sustainable eco managed forests. 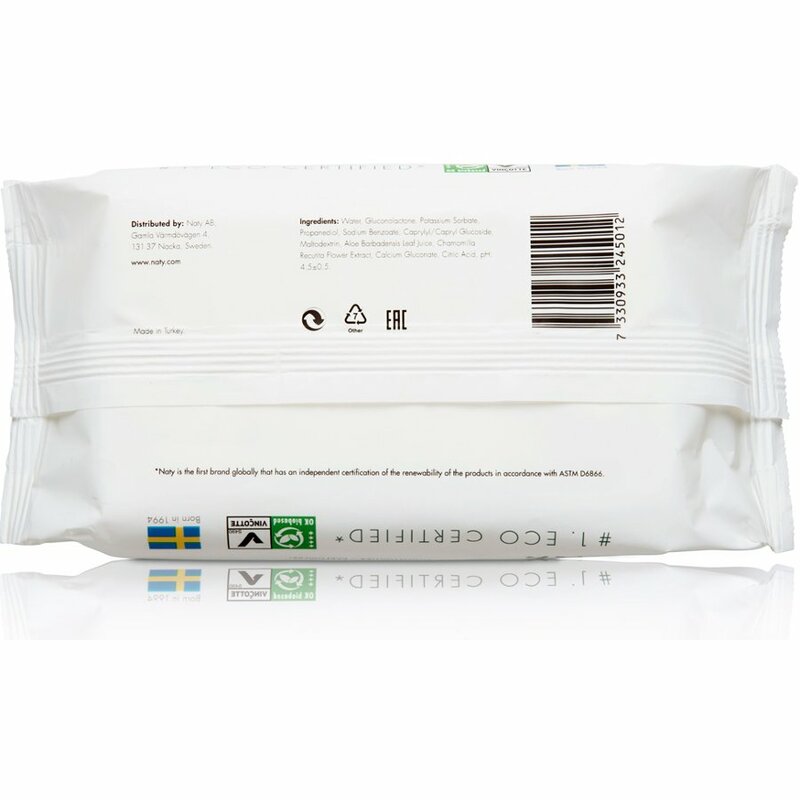 These wipes perform as well as the best 'traditional' wipes, and they are kinder to your child's skin as well as the environment, with chalk based packaging. 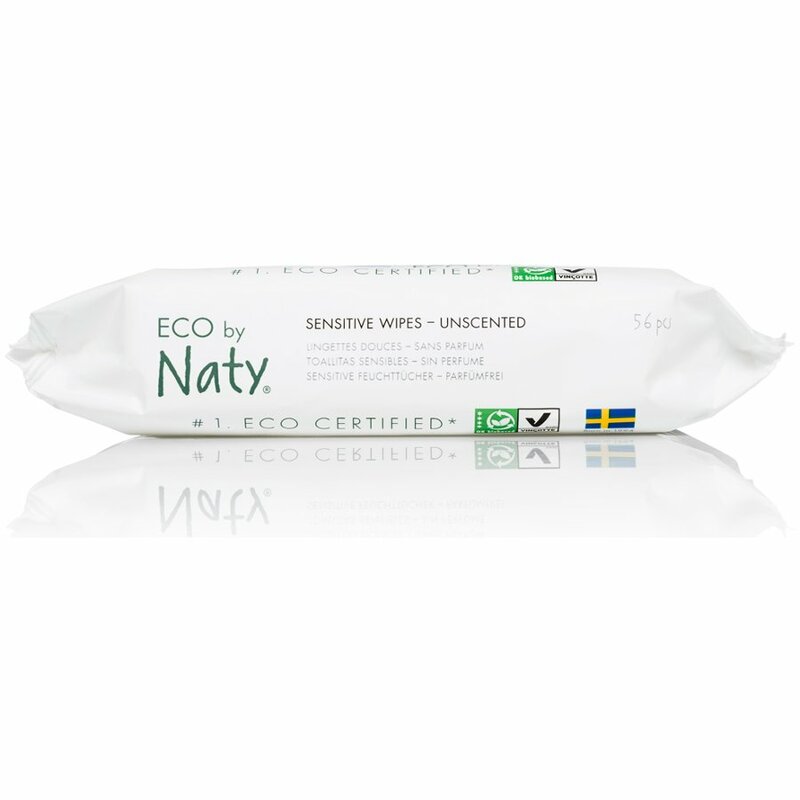 Eco by Naty's Sensitive Wiped have been awarded the "Good Environmental Choice" ECO label by the Swedish Society for Nature conservation. Aqua, Gluconolactone, Potassium Sorbate, Propanediol, Sodium Benzoate, Caprylyl/Capryl Glucoside, Maltodextrin, Aloe Barbadensis Leaf Juice, Chamomilla Recuita Flower extract, Calcium Gluconate, Citric Acid. 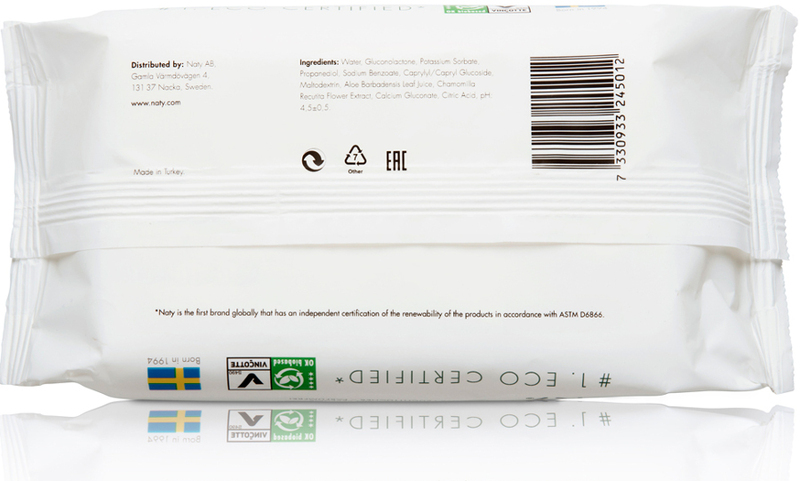 The Eco by Naty Unscented Sensitive Wipes - Pack Of 56 product ethics are indicated below. To learn more about these product ethics and to see related products, follow the links below. brilliant, i love that it doesn't dry my skin out after using it. I tend to get lots of wipes when I pull the wipes out. Otherwise a lovely product. 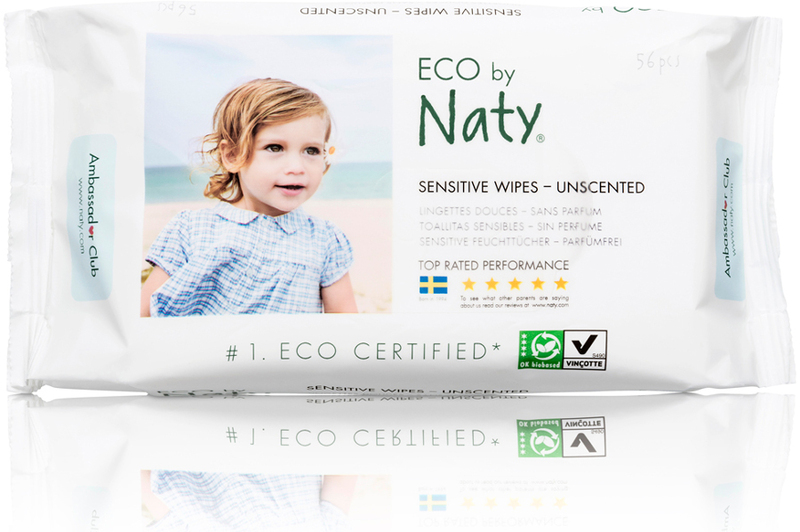 There are currently no questions to display about Eco by Naty Unscented Sensitive Wipes - Pack Of 56. Proud to be at the forefront of sustainable baby care, Eco by Naty specialises in high quality, naturally produced eco nappies amongst other health and cleanliness products. 100% chlorine, latex and plastic free, each Nature Babycare product is made from a combination of natural tree pulp and maize derivatives, with high levels of biodegradability to protect and maintain our environment. Cheaper than many eco-friendly children's products on the market, Nature Babycare is recommended by the Swedish Asthma & Allergy Association and are taking the world by storm.